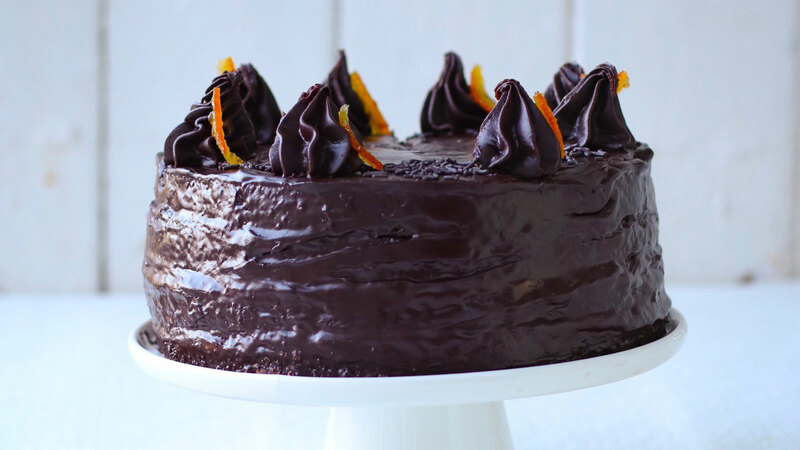 The combination of chocolate with citrus is a sure winner for any celebration. While this cake might look tricky to make, it is actually quite achieveable, especially with the use of our ready to use lemon and chocolate frostings. Making the sponges the day before will leave just an assembly job on the day of the party. Just ensure to keep them airtight for freshness. 1. Preheat the oven to 180C (fan 160C), 350F, Gas Mark 4. Grease four 20cm loose-bottomed sandwich tins, line the bases with baking parchment and grease again. If you only have two tins then halve the cake recipe and make in two batches. Set aside on baking sheets. 2. Whisk the sugar and eggs in a large bowl with electric beaters until really pale and fluffy. It should be thick enough to hold a trail of the mixture from the whisk. 3. Sift half of the flour over and very gently fold it through before adding the rest. Fold in the orange essence then also. Divide the mixture evenly between the tins, spreading it level with the back of a spoon. 4. Bake for 15 minutes until cooked through and golden. Carefully remove from the tins and leave to cool completely on a wire rack. 5. Pick out as many of the orange zest pieces from the marmalade as you can and set aside. Stir the remaining marmalade until smooth and divide it evenly between three of the cake layers, spreading it all over. Stir the lemon frosting until spreadable and spread a third on each also. Stack these cake layers on a serving plate or cake stand and top with the remaining cake layer. 6. Spoon 150g of the chocolate frosting into a disposable piping bag, which has been fitted with a star nozzle, and set aside. Sit the tub with the remainder of frosting into a bowl of hot water for a few minutes and stir well to loosen to a softer consistency. Spread the frosting all over the top and sides of the cake smoothly until completely coated. Pipe rosettes of the icing from the bag around the outside edge of the top, leaving space between. Sprinkle the chocolate sprinkles on the spaces in between. Arrange the orange zest pieces standing up against the chocolate rosettes and serve. Tip: A palette knife dipped in boiled water and wiped dry with kitchen paper regularly, will make an easy job of spreading the frosting all over the cake.